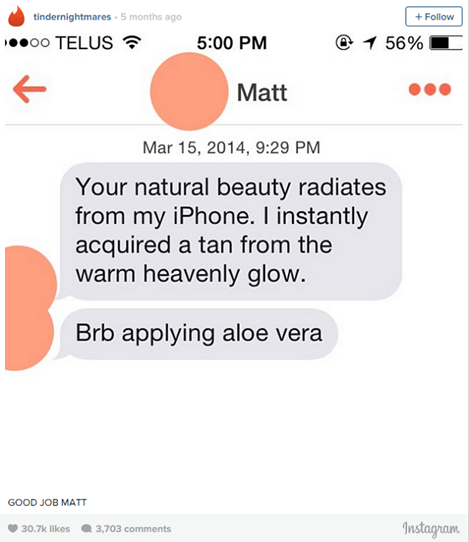 Opening Tinder lines in all of their creative-yet-cringe glory. 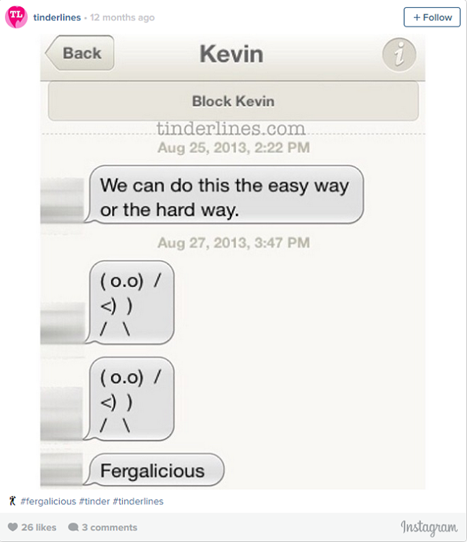 Breaking the ice on the dating app Tinder can go one of two ways: so so right, or so so wrong. To the extent that, there are countless Instagram accounts dedicated to sharing the latter amounting to unprecedented levels of cringe, because – as it turns out – they’ve become the rule, not the exception (yuck!). But there are very rare occasions in which a creative attempt at being charming and/or funny can actually be pulled off. While they mightn’t all be up your alley or get your heart racing, sometimes it’s good for the soul to just give decorum a bit of a side step and indulge in a cheeky lol at other people’s (mis)fortune. LOL, he’s always like this. LOLOLOLOL. A lot of work was put into this. A for effort. Open with a bit about baby deers and you can’t go wrong… That battery percentage is v concerning tho. Genuine fear at the thought of losing you? Quite sweet, actually. Sometimes you just need cheese (and fruit).y. Get right to the point, cheers. Props for committing to this pick up line. 3000 gentleman points for you, sir. It’s good to be prepared for all possible scenarios. Not showing up empty-handed gets a further 3000 gent points. Serious moves and great taste in music = potential bonking. He really wants to make it work. He brings sunshine. Protects you from pricks. He’s a champ. Well played, Josh. Well played. Nothing like laying all of your cards – uhh- bare. Some people think being needed is “romantic”… *facepalm*.